When lists are made of some of the up-and-coming "new folk" style singer-songwriters on the scene these days, the name Pierce Pettis often comes up, mentioned in the same breath as people like Christine Lavin, John Gorka, Patty Larkin and Susan Werner. Pettis has been on the folk circuit for about a decade now and has released three CDs over the years, the most recent being Chase the Buffalo issued a little over three years ago, an album that won a lot of kudos in the acoustic folk world. A talented writer with an easy-going baritone voice, Pettis also does what folk musicians used to do back in the old days -- become involved in social causes. In Pettis' case, it's with the Habitat for Humanity Organization that is also a favorite of former President Carter. In recent years, Pettis has been living in Georgia, but also spending time in Nashville, where he works as a staff songwriter for a publishing company. But his own music is anything but typical commercial country. He comes up with articulate and, in the case of this release, sometimes spiritually- or Biblically-influenced songs. On Making Light of It, Pettis is joined by producer David Minor, who worked in T-Bone Burnett's band and also produced one of Elvis Costello's albums. Minor also produced Pettis' previous CD and serves again as bassist. Other players in this Nashville and Southern-California recorded project are guitarist Derri Daugherty, keyboardist David Webb and percussionist Steve Hindalong. There are fewer cameo appearances by well-known people this time. On Chase the Buffalo, members of Los Lobos and drummer Jim Keltner were prominent guests, but the unsupplemented band on this CD is just fine, serving up tasteful versions of Pettis' songs which run from rock-influenced to more intimate in style, and in subject from love lyrics to Biblical stories. Pettis himself is heard on guitar, sometimes playing a specially-made seven string instrument. As a composer, Pettis is an avid collaborator, having written songs with several people over the years. Six of this album's fourteen pieces are collaborative works, and one can hear some of the influence of the other writers in the different directions taken in the joint compositions. Pettis can be compared in some ways to John Gorka, in both his vocal style and his gift for the lyric turn-of-phrase. While Gorka can give great profundity to the ordinary, Pettis often chooses weightier subjects to begin with. The title piece of his last album dealt with Native Americans and their relationship to the bison. This album does have more love songs, but there is a certain deepness in his approach, and there are two songs directly based on Biblical narrative. 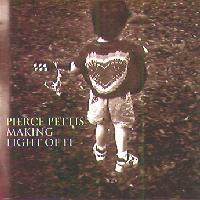 People are already calling Pierce Pettis' new album Making Light of It his best release yet. I would probably agree with that, in terms of the quality of the material and the more tasteful, scaled back, intimate arrangements that allow the listener to focus better on Pettis and his songs. Pettis is one of a relative few performers who can bring a little religion into his music without being preachy. But the majority his songs deal with the perennial theme of personal relationships. His performance style is easy-going and appealing, and his lyrical wordcraft world-class. Though the album's production and arrangements, especially the creative use of percussion, are first-rate, the album's sound has some significant problems. Pettis' vocals are often a bit distorted, as if recorded at too high a level on analogue tape, and the overall sound is much too heavily compressed, killing the dynamic range of this mostly acoustic music and perhaps contributing to the muddying of Pettis' vocals. The bad sound detracts from this otherwise very fine record. In the three years since his last album, Pierce Pettis has obviously been further honing his skills at his craft. Making Light of It underscores his position as one of the bright lights on the contemporary singer-songwriter scene.